Sooner or later, everyone faces doubts about their progress on the path. But that’s a good thing, says Doug Phillips, as long as we’re prepared to meet that doubt honestly. The Bahiya Sutta shows us how. Then Bahiya, deeply chastened by the devata, left Supparaka and in the space of one day and night went all the way to where the Buddha was staying. There he found a number of monks doing walking meditation outside and went directly up to them and asked, “Where, venerable sirs, is the Blessed One staying? 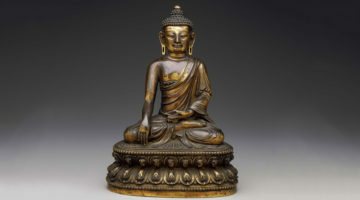 I must see him immediately.” He was told that the Buddha had gone into the town for alms. Bahiya pleaded with the Buddha a second time, “But Holy One, it is hard to know for sure what dangers there may be for the Buddha’s life, or what dangers there may be for mine. Please teach me the dhamma, O Blessed One, so that I may be happy and free.” And again the Buddha tried to put Bahiya off saying that this was not the right time as they were on alms round. Upon hearing this brief explanation from the Buddha, Bahiya was immediately released from all forms of suffering generated by clinging, desire, aversion, and ignorance. The Buddha then went on his way. 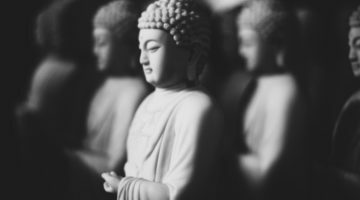 The Bahiya Sutta stands out among the Pali suttas, inspiring us 2,500 years later with this dramatic encounter between a student of the Way and the Buddha. It speaks directly to contemplative practice, offering a clear and powerful summation of the Buddha’s teachings on awareness and freedom. When we first meet Bahiya, he is already a well-known and accomplished teacher with many students who take care of him. Today he might be the director of a Buddhist center or may have written a book or two; he might even be regularly published in a journal such as this one. This alone makes Bahiya neither unique nor inspirational; neither does the powerful doubt that will drive him on his quest. Bahiya is struck by what we refer to in Zen practice as “great doubt.” It’s not just that he questions the depth of his understanding, the direction of his practice, or the degree of his liberation, but that he allows this self-questioning, this doubt, to stay around a bit. He doesn’t try to get rid of it by going more deeply into samadhi, nor does he defensively dismiss it. Like the breath or a koan, Bahiya keeps company with his doubt, sincerely taking the role of host to this troublesome guest. This willingness to stay present and open makes possible the visitation of another voice, that of the devata, a spirit-being that may be seen as an embodiment of a feminine wisdom that Bahiya has become cut off from internally. She challenges him with an almost brutal directness, confirming Bahiya’s suspicions about his level of attainment by telling him that despite his many years of hard practice and admiring students, he is not even a beginner on the path. She tells him bluntly that his practice is worthless and his so-called spiritual attainments are a sham. This is not something that happens only in ancient teaching stories. Sooner or later it happens to many of us, and it can be devastating. Maybe we have been practicing with real devotion—sitting regularly, doing lots of retreats, taking good care of our bodies, and practicing right livelihood. Or maybe we are just doing a minimal maintenance practice, fooling ourselves that it is something more. Whatever our situation, sooner or later a challenge comes along that precipitates real doubt about the worth of our doing this work at all. We lose a job, fall into depression, lose an important relationship, or have health problems, and we find ourselves flailing around in the midst of fear, anger, betrayal, and bitterness. Whatever toxic mixture we find ourselves in, we begin to question our worth, the worth of our practice, the worth of our teacher, and even the dharma itself. Or maybe this nagging doubt occurs because after several months or even years of practice, we still find ourselves yelling at our children, partners, or other drivers on the road. Somehow the expectations we have for the results of our practice just don’t match up with the reality of how we actually live. Great doubt, or great inquiry, is a crucial determining factor for our contemplative work and a significant fork in the road. How shall we proceed? One direction is down the path of helplessness, resignation, self-judgment, despair, and bitterness. Sometimes we have to travel down this first path a considerable distance before realizing its futility and destructiveness. This path is not the path leading to the great death in which our life is transformed and lived fully and courageously. Instead, it is lifeless. 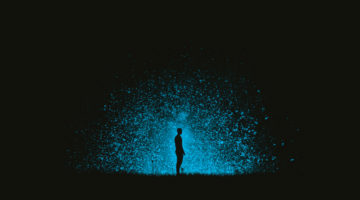 The other path is that of practice—through right effort, persistence, and courage, we use what seems to be an assault as an invitation to examine the ways of the thinking mind and know it more deeply, seeing clearly its attachments, deceits, and fears, and the ways it imposes arbitrary limitations. We use what has happened to us, and our reactions to it, as a mirror to see ourselves more clearly. The teacher Vimala Thakar once said, “Achieving some understanding is not so difficult. The real question is, why do we not immediately live the understanding we have without hesitation?” Why is it that after seeing what is false, we hesitate to live what is true? What is the resistance we so often encounter? When Bahiya is told that his practice and attainment are utterly bogus, unlike many of us, he does not defend, rationalize, deny, or launch a counterattack. Instead, setting an example, he does two things: First, he asks if there is an enlightened person around who can teach him how to get free. If I don’t have it, where can I find it? And when told that there is and where he can be found, Bahiya immediately and without hesitation goes to find him. He doesn’t ask how much this new guy might charge him for lessons or whether there is a monthly fee to join the sangha. He doesn’t wait to collect a retinue to carry his stuff or go and get things in just the right order for his departure. Bahiya drops everything and literally runs toward the truth, toward the Enlightened One. There is urgency, a complete and unhesitating commitment to one thing and one thing only: freedom. Each and every one of us has some of this “Bahiya energy” in us to know and actualize. One of the dangers in a teaching like this is that it is easy for us to create an ideal for our life of practice, on and off the cushion, which only separates us further from our daily reality; we can simply construct another target to shoot at and miss. Maybe it is unwise or even destructive for us to “drop everything,” but we can look more closely at the attachments we have that we so often vigorously and mindlessly cultivate. Perhaps we become a bit more honest, less willing to fool ourselves and those we care about. We can challenge the rationalization that we’re sitting enough or don’t really need retreat practice, or that our drinking is not really a problem. Maybe we begin to wonder why we’re walking slowly toward the truth of being alive in this moment instead of running toward it full tilt like Bahiya. We can question what this truth really is and what we are willing to sacrifice for it. Is truth a thing to be “found” in an imagined future, as Bahiya believed, or is freedom something always and only available now, right where we are? Running toward the truth of our life with full commitment may not mean going somewhere or attaining something we imagine we don’t already have. It may be about a willingness to turn directly into this moment, in this place, and discover that what is most true is very close indeed. Could it be that the journey “there” begins and ends right here and now in this moment, completely outside of time? Setting up some ideal and striving to attain it in an imagined future just creates conflict in the mind, leaving us neither here nor there. By learning how to live fully and with freedom from suffering in the life we actually have, we open the door of transformation as exemplified by Bahiya. Doing so means having the willingness to acknowledge and stay with the gap that inevitably appears between our actual life and the one we imagine; it requires us to honestly assess how we are living, then to act directly and immediately on that information. This practice alone can revolutionize our life. So here is Bahiya, the ideal student. And here we are, the actual one. Can we begin to examine our own pursuit of freedom? Can we question how we are actually living? Are we willing to confront our choices? The first question might be, How do I want to live? Then, How am I actually living? And finally, Am I willing to inquire deeply into the gap between the two so that my life might become less divided and contradictory? Bahiya inspires us with his persistence and urgency before meeting the Buddha; he then inspires us in that encounter as well. He is respectful but tenacious, unwilling to be deflected or put off until another time. There is a clear and penetrating understanding that there is no other time but now—that nothing can be put off into the future because the future does not exist. It is completely unpredictable. Now is now and that is all there is. Even now is already on its way to becoming something else. Now is the only time we can do what is most important for us to do. We say we’ll do it tomorrow, but tomorrow never comes. It is always and only in this moment that transformation and freedom can occur. It is only in this moment that we can live, love, and die. The urgency and fire of Bahiya’s persistence is fed by his knowledge of impermanence. We live in a body that is both amazingly resilient and exquisitely fragile. A bump on the head with the right force and we are suddenly somebody else. Bahiya has a clear sense that death is always close at hand, and he uses this awareness with great skill in his pursuit of freedom. What is it that feeds the fire of our urgency? Death-awareness practice, or marana-sati, can certainly do this, as can an unwelcome medical diagnosis or a close brush with death. These encounters can wake us up to the fact that the next moment is promised to no one. We have a choice about how we will live this moment. The end of Bahiya’s story reinforces this dramatically, but there are other less dramatic ways that life calls us back to the perfect completeness of the eternal present: the ringing telephone, the crying baby, an embrace with someone we love, the golden light of the late afternoon sun high in the trees, the call of a distant crow. Life is continuously calling out to itself. We only have to listen. After rebuffing Bahiya’s request for teaching three times, the Buddha opens his compassionate heart to this ardent and very ripe seeker, this one who has literally dropped it all, emptied himself of everything except his burning urgency for awakening and freedom. The Buddha meets this naked openness with a simple and powerful teaching: “Bahiya, this is how you should train yourself: whenever you hear a sound, simply hear; whenever you see a sight, simply see; whenever you taste a flavor, simply taste; whenever you feel a sensation, simply feel; whenever a thought arises, let it be simply a thought. Then, Bahiya, ‘you’ will not exist; whenever you do not exist, you will not be found in this world, another world, or in between. That is the end of suffering.” Bahiya gets it completely—he swallows it whole, digests it instantly, and is fully awakened. When the Buddha speaks to Bahiya, he is also speaking directly to us over the span of centuries. Each of us is Bahiya being told, “Please train yourself like this!” But how can we do it? The gateway to wisdom, compassion, simplicity, and wholeness is in what stands before us right now. Whatever is here now—fear, judgment, irritation, fogginess of mind—is where we are. Can we meet the mind states that reactively arise in us with complete attention? This is the work of knowing the self in relationship. And it is often a hard road. Life is always presenting new challenges to flush out the corners of our self-conditioning and giving rise to fresh opportunities for us to wake up again into our natural state and see exactly where we are stuck. As Huineng observed centuries ago, “As far as buddhanature is concerned, there is no difference between a sinner and a saint. One moment of awakening, and an ordinary person is a buddha. One moment of delusion, and a buddha is once again an ordinary person.” And so it goes. One last way to understand the Buddha’s teaching to Bahiya, and to us, is as an invitation to enter spacious and choiceless awareness. We can practice with each of the sense doors (seeing, hearing, smelling, tasting, touching, and thinking) and work with the hindrances in a direct and intimate way. We can also open to everything at once without choice or preference, agenda or direction; we can simply sit silently and alertly, open to whatever shows up. Life simply aware of itself. This is no longer an intentional practice of doing. It is the full expression of being alive on and off the cushion, every sense open, alert, receptive. Relaxing body and mind into simply listening, seeing, and hearing, there is no “me” doing anything, nothing to choose and nothing to reject. Thoughts arise, sights and sounds come and go, all known by awareness. This awareness doesn’t need “you” at all. If “you” are not there and there is only seeing, hearing, and so on, what has happened to suffering, to discontent? Might this be exactly what the Buddha is pointing to as the freedom of awakening? When you are not there as a separate thought in the moment of choiceless awareness, then the call and response of life are happening in complete harmony and with complete ease. And even when we miss that moment of freedom and are lost in struggle, conflict, and suffering, at some point, choicelessly, there is that small waking up and seeing clearly that is also simply this. Nothing is excluded. There is a place at the table for each of the many beings who show up. Fear sits beside hope, which sits beside sadness, which sits across from joy, which is next to anger, which is next to love, and on and on. They visit and hang around for as long as they do, then are back on their way as long as “I” am not there to block their journey. When there is just this, then the host of awareness and the guest of whatever is passing through are in complete harmony. That is the end of suffering. This path beyond suffering is one of learning and using our life as the way to greater freedom and compassion. We recognize the urgency of life calling out to itself. We see where we restrict ourselves through conditioned thinking and how we hold back from living fully, vibrantly, and joyfully because of unresolved wanting, aversion, fear, self-image, and ignorance. We begin to recognize this small, clear voice suggesting that we are sometimes fooling ourselves into believing that we are living fully, when we are really not valuing the incredible gift of this moment—even if this moment’s particular gift may not be what we want right now. How do we meet the fact of life and not withdraw because it is different from our fantasy of how it should be? That voice challenges us to stop fooling ourselves. Are we willing to ask the questions that Bahiya asked? Are we really willing to ask, listen to the answer, and then live that understanding without hesitation? 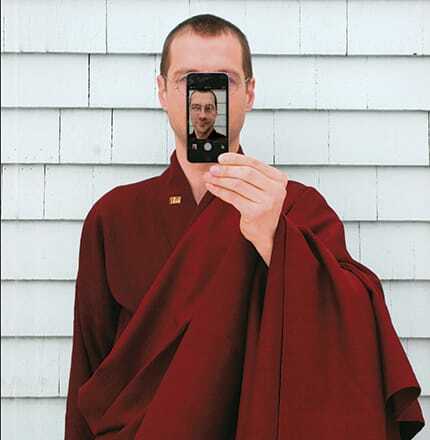 Douglas Phillips is the founder and guiding teacher of Empty Sky Sangha in West Cornwall, Connecticut, and Lexington, Massachusetts, where he teaches both Zen and Vipassana. He is also a clinical psychologist in private practice.